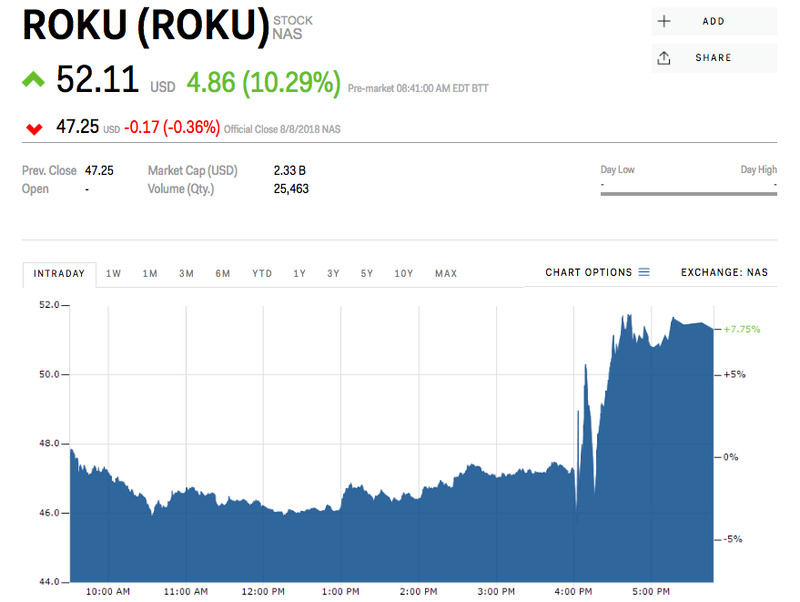 Roku topped Wall Street’s earnings expectations on Wednesday, posting a financially neutral quarter where analysts had anticipated a 14 cent loss per share. The streaming company’s ad business helped fuel the beat – an area Netflix and Amazon ignore. Shares surged more than 10% in after-hours trading following the release. Follow Roku’s stock price here. Shares of Roku were up more than 10% in early trading Thursday, indicating an opening price of $US52.15, after the company reported second-quarter earnings on Wednesday that blew Wall Street’s expectations out of the water. Revenue: $US156.8 million. Analysts were expecting $US141.5 million. EPS: 0 cents a share. Wall Street was looking for a loss of 14.6 cents a share. Revenue forecast (Q3): $US164 million to $US172 million. Analysts had previously predicted it would post $US166.5 million in sales in the third quarter. Net loss (Q3 forecast, non-GAAP): $US3 million to $US8 million. Wall Street’s prior estimate was an adjusted net loss of 11.6 million for the period. Subscribers: 22 million. That’s up from 20.8 million in the first quarter and 15.1 million in the same quarter of 2017. If the stock continues to climb in trading Thursday, it could easily top its record high of $US52.70, set back in February. The earnings report also solidifies Roku’s clear delineation from its streaming competitors like Netflix and Amazon: advertising. The two elephants in the room don’t advertise, and instead, the giants rely on subscriber numbers to fuel nearly all of their revenue. “It’s a mainstream ad business,” CEO Anthony Wood told analysts on a conference call. More than half of the top 200 advertisers listed by Ad Age now advertise via Roku, he said. That bump in advertising helped Roku’s revenue climb to $US16.60 per user on a 12-month trailing basis, up from $US11.22 a year ago. Wall Street analysts have ratcheted up their estimates for Roku following the earnings report, and now have an average price target of $US53, according to Bloomberg, up from $US45 before the report. Shares were flat since the beginning of the year before Thursday’s pre-market surge. Troy Wolverton contributed to this report.